VLocity 160 diesel multiple units are high-speed trains manufactured by Bombardier Transportation. VLocity 160 DMU can travel with a maximum speed of 160kmph. Each train set of VLocity 160 DMU consists of two cars with a seating capacity of 144. Image courtesy of Marcus Wong Wongm. VLocity 160 DMU trains feature only economy class seats. Image courtesy of Mcbridematt. VLocity 160 diesel multiple units (DMUs), which are manufactured by Bombardier Transportation, operate on the V/Line in Australia. The vehicles were procured by the State Government of Victoria as part of the Regional Fast Rail (RFR) project, undertaken between 2000 and 2006. The project aimed to improve passenger services across the Victorian regional railway network. VLocity 160 was put into operation in December 2005. The train set operates at a speed of 160kmph and provides flexible solutions that are adoptable to local Australian conditions. The vehicle is currently serving as a reliable solution to the future of Australia’s high-speed rail transport. "The vehicles were procured by the State Government of Victoria as part of the Regional Fast Rail (RFR) project." The VLocity 160 DMU has been developed using more than 20 years of Bombardier’s experience in Australia’s regional rail transport industry. It is designed based on Bombardier’s previous successful DMU models – Xplorer and Endeavour. The train sets have been designed in Australia and are manufactured at the company’s Dandenong facility, in Victoria. The length of each individual car of the VLocity 160 is 25,255mm. The rail car has a width of 2,920mm and runs on a 1,600mm track gauge. It features Bombardier’s MITRAC control system. Each train set consists of two cars which are coupled permanently. The inter-car connection is completely water-proofed and can be coupled to form an eight car train set. A two car train unit has a capacity to accommodate 144 passengers and a three car unit can accommodate 214 passengers. The exterior of the car is made of stainless steel, which requires less maintenance. The exteriors have been styled to promote a statement of reliability and elegance. Proven elements and components are included in the design of the vehicle to improve reliability and flexibility. These are complemented with diagnostic systems designed to reduce maintenance of the vehicle. "The train sets have been designed in Australia and are manufactured at the company’s Dandenong facility, in Victoria." A modular approach has been adopted while designing the exteriors and interiors of the train right from the propulsion to the seating system. This enables the rail cars to be tailored according to the economical demands of different routes. Fire safety, upcoming passenger trends and functioning were factors considered in the vehicle’s design and manufacture. This has helped in ensuring a high degree of efficiency in the vehicle’s services. The train set features a 2×2 seating layout, with some of the seats arranged in club style and others in aircraft style rows. Some seats are fixed in a forward direction and some in a backward direction. The seats do not have option to be reversed or rotated. The vehicle has only economy class seating and includes four locations for wheelchairs in the two car set and six locations in the three car set. The rail cars are air-conditioned and covered with tinted glasses. Overhead racks are installed for small size baggage, while large baggage can be stored at specifically reserved space in the centre of the unit. The train set also includes spaces large enough to accommodate bicycles and surfboards. Around 40 train sets were ordered between 2006 and 2007, of which 14 were ordered in November 2006 and eight in October 2007. In September 2008, nine three car train-sets for operation on the V/Line network were ordered, with an additional centre car, to increase the length of two cars in the existing fleet. 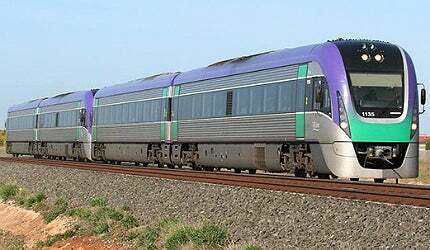 A $95m contract was awarded by the Victorian government to Bombardier in February 2009 for supplying 32 two car and three car VLocity DMU’s for operations on the V/Line. This has increased the total number of VLocity DMU’s operating on the V/Line to 134. In November 2012, a $216m contract was awarded by the Public Transport Victoria (PTV) to Bombardier for the supply of 40 DMUs. The contract also includes the supply of 19 intermediate cars and seven three car train sets. The intermediate cars will be used to upgrade two car units in the existing fleet to three car units. This will increase the total number of cars in the fleet to 58. Previously known as Spencer Street Station, the Southern Cross Station is a major rail terminal in Victoria, Australia.